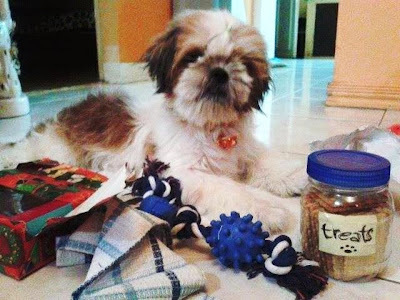 The newly groomed Lucio (the reason why he is not hairy ) also received his share of gifts. 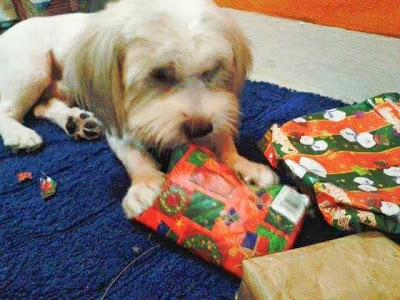 You see how excited he was opening those gifts? Unlike Marcus, Lucio seemed like already contented after opening the first gift as he almost didn't mind the rest. He was preoccupied with the bone food treat that I gave him that he already forgot his other gifts. It's so funny how we can treat these dogs as humans. lol We celebrate their birthdays, too! Oh, next month will be Marcus 1st birthday. I wonder what could we prepare for him on that special day. Now that is so adorable. We give our cat a holiday gift too and I love that you shared yours here... Hope all is well with you. Wishing you and your loved ones a very Happy New Year! So cute! I have a parrot and I prepared a new toy for him. Now he is playing with it all the time. I think it is a good idea to give presents to pets more often.